In present day, an array of car keys exist for the auto owner to make choice when the need to change or restore a car key arises; A few reasons for changing a car key may include; breakage of the key in the ignition, misplacement of the original sets, lose to theft or non- functionality of the transponder. It is critical to understand and distinguish your car keys to make replacement or changes easier when the situation demands. In time past, replacing car keys were easy. It only demanded a visit to the auto locksmith. However, with the surge in technology, it has become difficult and daunting. Anti-theft gadgets, and developed locking systems have muddled up the process, making it a bit complex. You do not desire to be caught up on the balance; do you? For this reason, Templelocksmith24 has outlined the variety of car keys to identify and make your choice. These are long established keys lacking any sort of encoding and present in old fashioned cars. Typically, they are the oldest and are mechanically produced either by cutting, punching or by other orthodox methods. The basic car keys can be made to match any key lobe. They are quite simple to copy and so predisposes cars to theft. Owners install extra security by providing electronic and security alarms in their cars. The flip of the basic is the remote control type. Modern cars are emerging. They are furnished with advanced key types which are much difficult to copy. Owners gain access by remotely controlling the locks as well as the ignition. They are smart, and possess toggles on the key fobs. Seemingly like the transponder keys, making a copy will be via coding. Typically, they work by infrared prompting; whereby coded messages are sent to the car receiver. Though rare, signal disturbances could deny access to the car. The demand for transponder chip keys is surging. The transponder keys are furnished with microchips that functions as a vehicle immobilizer. The chips are disarmed the moment the ignition is on and are designed to function through codes which are distinctive and peculiar to the individual car. They arrive with electronic transmitters known as key fobs. They are not mechanically fashioned and as such they are difficult to copy. 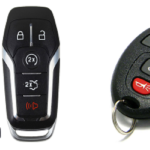 Replacing the transponder key entails programming by a locksmith, the manufacturer or dealership. With transponder machines, the locksmith retrieves matched codes from the database made available by car manufacturers. With these codes, a microchip is designed to copy a transponder key for your car. The transponder is not easy to hack or copy thus; replacement could be a bit costly. Similarly designed as the mechanical cut keys, the laser arrives with a much more reliable make with improved security value. They ridges, shapes and styles it comes with make it difficult to copy. To duplicate the laser, a special machine is required with in-depth knowledge of its usage. The Locksmith incises the sides of the frames precisely with internal machines to the required thickness and groves. For the fact that they require specialized machines for replacement, it could be expensive. The master keys are becoming rare. In time past, rather than owning them for normal use, the master keys were used by car dealerships to copy, design and replace car keys. The latest technology has made available car programming codes on databases; hence forcing the master keys out of the market. Nevertheless, owners of fairly used cars which are finished with master keys should request and check the manual to be sure it comes along with the other keys. This is because misplacing the master key will warrant changing the entire engine management apparatus. Valet is typical and conventional even in professional driving. A valet key restricts access to a car and offers the owner the comfort of safety for his belonging even while in valet car parking. With the valet keys, the Valet gains entry into the car to ignite but there is a limitation to what he can do. Recent designs are finished with usual keys used in specific times including packing or re-packing of cars by proxy. The Valet keys are proto-types of complex sets, so; they are easy to replace or copy by the locksmith. Other key types include the Smart keys, Switchable blade keys and the VAT keys all of which offers unique and distinguishable features. So, are there reasons you would want to change your car keys? If you are confused and unable to identify which key works for your car, you can contact us at Tempe Locksmith 24. You will be glad you did.